MINT Journal Founder Irina Lakicevic with her Céline Tie Tote Bag. Céline has established itself as an industry favourite not only through iconic, minimalistic designs but also through the use of exquisite luxury materials such as smooth calfskin, wool and suede – thank you Phoebe! We recently had the chance to restore Irina Lakicevic’s first ever Céline bag and not unlike many other fashion insiders, she has been a loyal fan ever since. In Irina’s own words: “I just loved how special the colour and the shape was. It was crisp, yet not clinical and the colour just worked with everything.” Equally amazed by the beautiful leather quality and unique colour depth of her Céline Tie Tote, we felt compelled to dedicate a case study to this special piece. 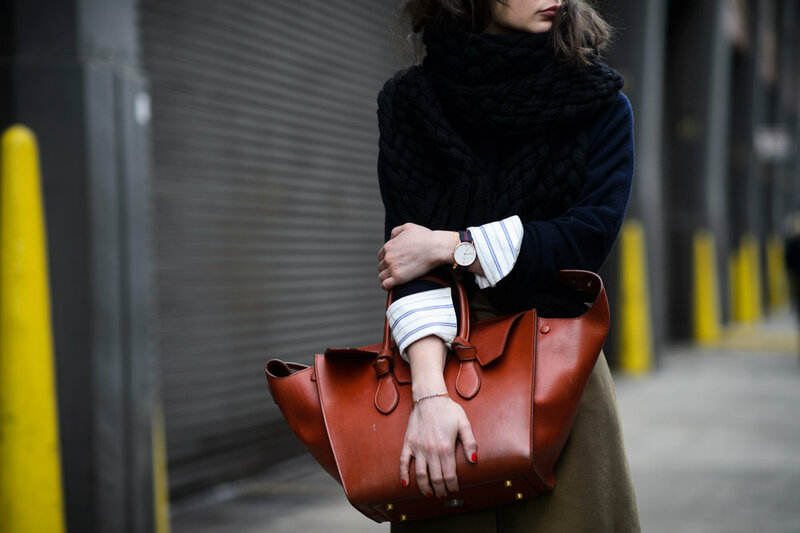 The Tie Tote bag was first introduced during the Winter 2013 Collection as a revised version of the highly popular predecessor: Céline Phantom. The exterior of Irina’s tote is made out of robust saddle leather in an intense Brick shade and the large front flap can be worn tucked inside. In the case of this Céline, the deep multi-layered tone is not achieved through a flat paint. Meaning, the leather is vegetable tanned, where the natural characteristics and transparency of the material is kept intact, and dyed with natural tannins. During its life, this bag will acquire a difference in tonality that is called a patina and retain some marks that add to its unique character. This piece had a large watermark across the bottom part of the body while the general colour looked a bit dull. Moreover, the edge paint showed signs of cracking due to dryness and age while the stained lining needed a deep clean. If the client prefers to eliminate all the dark marks and tone variations present in the leather, we’d then suggest a paint that will blend in and lightly cover the natural tone. However, this approach would change the natural characteristic of the leather and hide its patina. When an item is too damaged, for instance with pen marks, then this will prove to be the best procedure. The second option is to use special cleaning techniques and remove as much of the dirt and watermarks as possible. The tone is then enhanced with a combination of dyes and conditioners. These dyes are translucent and will add just a hint of colour to the leather without completely covering any deep stains or the original colour. As the stains appeared to be manageable, the atelier team opted for the second technique to preserve the authentic look of Irina’s Céline. The first step of the restoration was to reduce the watermarks by applying products especially designed for vegetable tanned leather. This type of cleaning also helps to condition the leather from the inside out. The interior of the Tie Tote bag is unlined and has a suede like appearance, which unfortunately tends to gather a lot of dirt. While cleaning the inside of the bag, we also made sure to remove any damaged edge paint, which is the thicker paint that covers the edge of the leather- as seen on straps, details and the gusset of your bag. Once the old edge paint was removed and the bag was fully cleaned, we applied the newly hand-matched paint to seal the edges of the leather and improve the look of the handles. The edging had to be done in several coatings while allowing time in between each layer to make sure the paint dries, and adheres properly to the material. 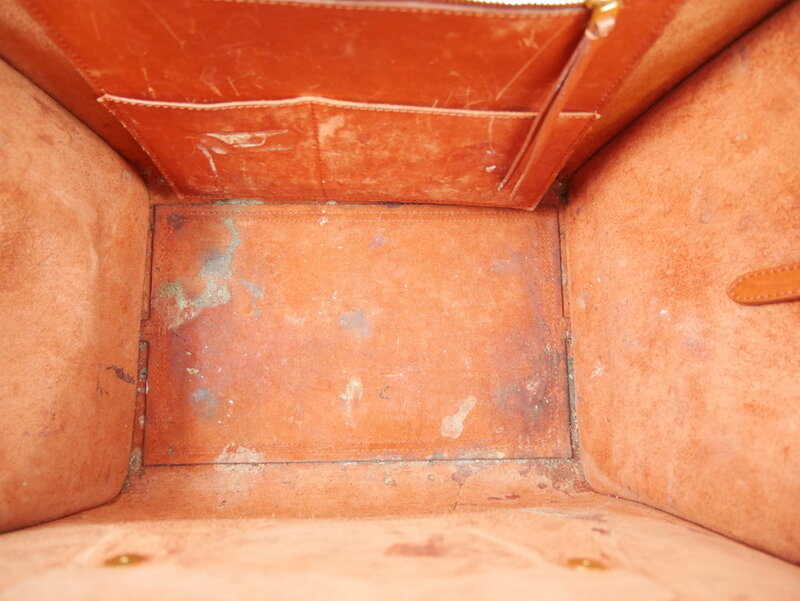 The last part of the restoration process was to enhance the overall colour of the bag. The rich tint that’s achieved through a combination of natural dyes and cream gave “new life “to the leather, as it added depth to the colour and reduced the appearance of scratches. Finally, a layer of wax was applied to seal in the dyes and polish the leather. The Restory specialises in offering seamless repairs through the use of tailored artisan skill. Our ultimate goal is to carry out ‘invisible’ restorations and bring any piece back to its (near) original state. Curious about our bespoke work? Fill out a Quote Request Form and receive a preliminary quote.